Annual parasitic vine over 50 cm long Stem: orange or pinkish yellow, climbing on other plants and attaching to them with specialized outgrowths (haustoria) which invade tissue of the host plant to absorb food. Leaves: alternate, orange or pinkish yellow, very small, scale-like. Flowers: many, stalkless, white, small, 2.5 - 4 mm tall, radially symmetric, somewhat bell-shaped with five, spreading, blunt-tipped petal lobes. The flowers are arranged in nearly stalkless, relatively large (up to 2 cm diameter), dense, often tight, rounded clusters, which may be closely spaced or even continuous along sections of the stem. Sepals: five, but fused at base, then separating into five, rounded egg-shaped, relatively short (shorter than the petal tube), round-tipped lobes. Petals: five, but fused for about half their length, then separating into five, spreading or slightly reflexed, relatively wide, somewhat egg-shaped lobes with rounded tips. Stamens: five, attached to inside top of petal tube alternating the petal lobes, with short filaments, but the anthers visible and extending beyond petal lobes. Pistil: with one, two-chambered, superior ovary; and two, 1 - 1.5 mm long (about as long as ovary) styles which end in rounded stigmas. Fruit: small (2.5 - 3.5 mm tall), somewhat rounded egg-shaped, taller than wide, two- to four-seeded, membranous capsules with slight swollen raised area near top at the base of styles. The withered petal tube remains attached as a cup around the base of the fruit. Similar species: Cuscuta gronovii may superficially appear similar to C. glomerata since both can have stretches of continuous flower clusters (always so in C. glomerata), but its flowers are subtended by bracts, and the sepals are not fused. Of our other taxa with five-parted flowers, they have more scattered and separated flower clusters which are either smaller, or looser with obviously stalked flowers. The overall form of the inflorescence and flowers in C. cephalanthi or C. polygonorum may cause confusion with C. gronovii, but both of those species have only four-parted flowers which are much shorter (maximum 2.5 mm). Habitat and ecology: Common in low wet ground, especially near streams. 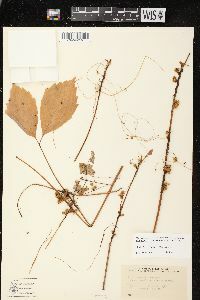 Notes: The Cuscutaceae family has only one genus, Cuscuta. The family has often been treated as a subfamily of the Convolvulaceae family since their flower structures are very similar despite their size differences. However, the two families have distinct chemical properties as well as the obvious differences in life style of non-chlorophyll producing, parasitic vines, versus independent, photosynthesizing, green vines and herbs. Etymology: Cuscuta is an ancient Latin name for dodder, probably of Arabic origin. Gronovii is named after Dutch Botanist Jan Frederik Gronovius (1690 - 1762). Fls 5-merous, 2.5-4 mm, sessile or subsessile in dense clusters; cal short, its lobes broadly round-ovate or subrotund, overlapping, often scarcely reaching the middle of the cor-tube; scales commonly copiously fringed, reaching the sinuses of the cor; styles 1-1.5 mm, nearly or fully as long as the ovary; stigma capitate; fr cupped below by the withered cor, commonly globose-ovoid, 2.5-3.5 mm, with a thickened collar about the styles; seeds 2-4, ±1.5 mm; 2n=60. N.S. to Man., s. to Fla. and Ariz.; our commonest sp.